A specially designed breast pump accessory for massaging the breast during expressing to provide extra milk duct stimulation and encourage milk ﬂow. Every so often you may want to get a new Air tube for your pump, depending on wear and tear. This is one length of tube to suit all Unimom Electric Breast Pumps. This unit is for the top of the Forte breast shield. It includes a white silicon round membrane, a bottom and a lid that clips on. This unit is for the top of the Allegro breast shield. It includes a white silicon round membrane, a bottom and a lid that clips on and a spring inside it. This silicon disk membrane is the part that moves up and down when pumping and is inside the milk back flow protector (top part of shield). This spring goes inside the milk back flow protector of the shield kit for an Allegro breast pump. Replacement Power pack for Allegro Breast pump. Replacement valve membrane for Forte, Minuet and Allegro breast shields. 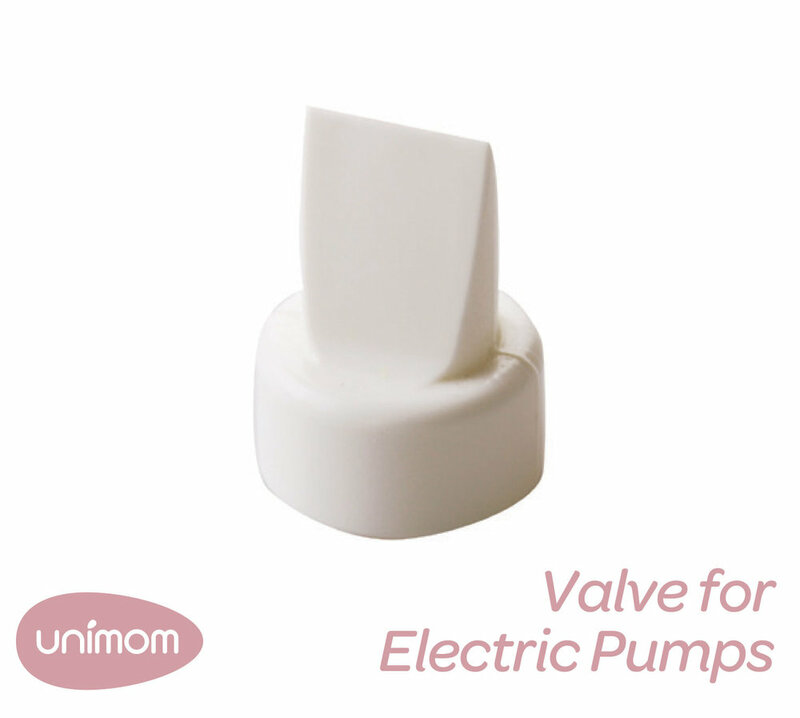 This membrane fits all Unimom electric breast pumps. Replacement valve membrane for the Mezzo Manual pump. Clear coloured. Clear silicon part for top unit of the Mezzo Manual Breast Pump. White bottle stand to keep your shield kit upright when not in use. Clear Dome Cover to go over the Unimom Bottle Collar. White shield cover for your breast shield. Keeps dust off the silicon massager and shield ready for use. This part plugs into the pump body enabling you to plug your hose in. If damaged you will need a replacement to eliminate air leaks. 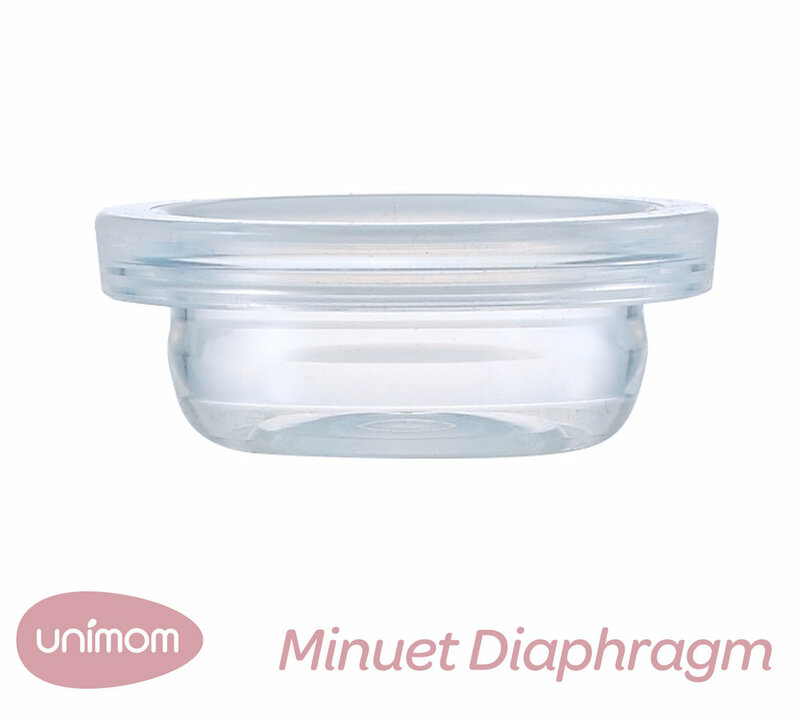 Clear silicon part for the top unit of the Minuet LCD breast pump. The cap which sits on top of the Minuet diaphragm. Attaches to the pump body enabling you to double pump. 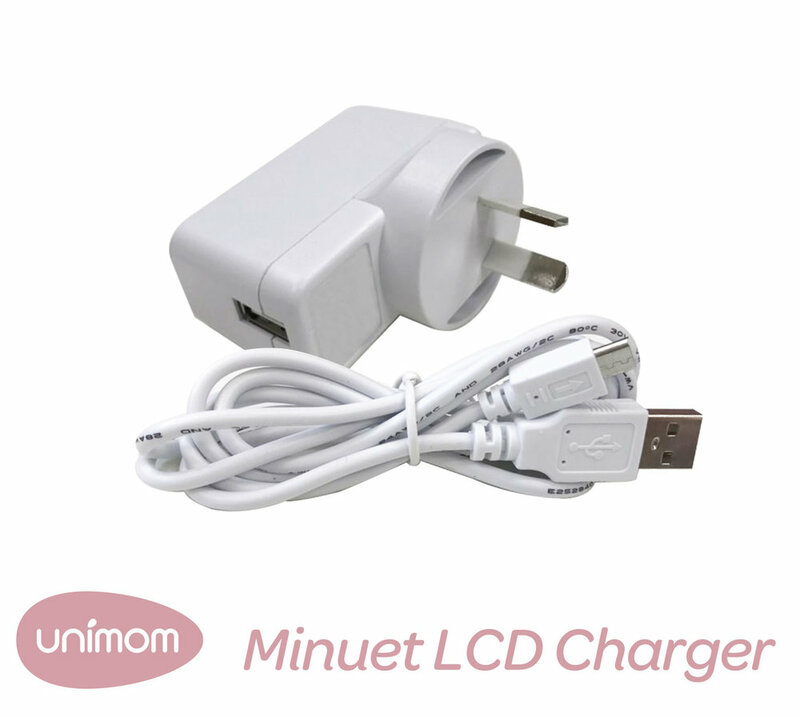 Charger kit for the Unimom Minuet LCD Breast Pump. Complete with AC adapter and USB Cable.